In 2005, the Detroit Diesel plant, a heavy duty diesel engine manufacturing facility near Rouge Park, was declared "functionally obsolete" by a visiting assessor. Daimler AG (then DaimlerChrysler), which had recently purchased the almost 70 year old facility, considered shuttering it. A concerted effort on the part of the plant's employees, however, including workers, managers and engineers, convinced Daimler otherwise. "We stood up," environmental engineer Chris Templeton told me, "and said, 'We are not going to be another facility to close.' We came up with a gameplan, presented it to Daimler, and said, 'This is what we can do as an organization. Please don't make this another story about another Detroit plant closing.' And we're still here." 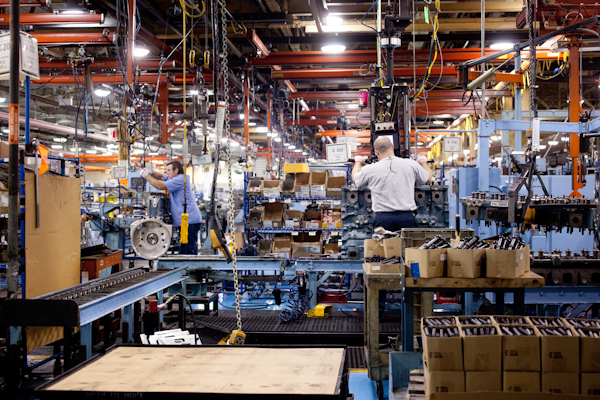 Not only is Detroit Diesel, which employees around 2,000 people, still here -- it's growing. When President Obama visited Detroit in December, he stopped by the plant to announce a new $100 million investment by Daimler, which will add two new production lines and 115 new jobs, transforming the facility into a complete power train manufacturing center. Detroit Diesel's continuing journey from "functionally obsolete" to robust and growing provides a fascinating and illuminating look at industrial sustainability in Detroit. A culture of sustainable thinking and action on all levels of the organization, from managers and engineers to hourly UAW workers, has helped steer the company away from obsolescence and toward a more secure, promising, and environmentally conscious future. This is a story not told often enough in Detroit, which is supposed to be "post-industrial" -- a story about how the industry that's still here is changing. Detroit Diesel's sustainable efforts include an EPA award-winning brownfield cleanup project, a dramatic increase in reuse and recycling (compare the 5,482 tons of material, excluding metals and oils, recycled in 2012 with the 158 tons recycled in 2004), and the decision to send recyclable materials to Michigan facilities for processing. The company has transformed an executive parking lot into a greenspace for all employees to use, and a concern with continuously improving energy efficiency, both in the plant itself and in the engines it produces, is a top priority. I could go on, because there's more to tell, but suffice it to say: sustainability touches virtually every aspect of work at Detroit Diesel, and workers at all levels are regularly looking for ways to reduce the company's environmental impact. To get a better understanding of what this kind of holistic, industrial sustainable thinking looks like from the ground level, I visited the facility and talked to three employees about their work: Chris, the environmental engineer, Paul Tousignant, a controls engineer, and Vito Randazzo, a material truck driver who's responsible for collecting and sorting recyclables.